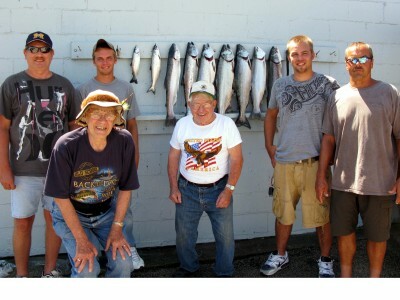 The afternoon fishing has been better for us than the morning the last two days. The morning bite has been slow on the bank. 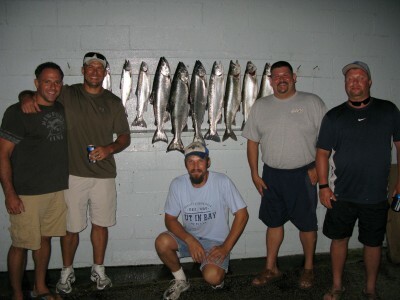 Our best fishing has been north of the point between 160 and 240 FOW. We only had one rigger bite this morning but we had several this afternoon. A pair of Yeck Copperheads 53 down on an out down took two Steelhead. The chute rigger set at 65 with regular Fuzzy Bear Yellowtails took a Laker and had another bite. Dreamweaver SS Lemon Limes down 50ft. on the other out down took a King. Our biggest fish of the day came on a 200 copper with a Fuzzy Bear Frozen Veggie on it. A regular Dreamweaver Beefeater on a 300 copper went twice. Our high wire out 180 with the White Crush Mountain Dew Spin Doctor/Cold Steel Big Water Meat Rig went twice this morning and once this afternoon. We were going to spend the last hour of the P.M. trip on the bank, but a thunder storm cut our trip short. We fished a double today. Started out in the 02’s in 90 FOW. We didn’t have much of a morning bite, two hits on a high wire diver out 155 with a 10” White Crush Mountain Dew Spin Doctor/Cold Steel Big Water Meat Rig. That was it. When we hit the 04’s we turned northwest and took it out to 300 FOW then brought it back in to 150 FOW. 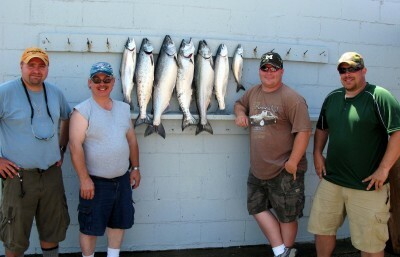 The action wasn’t fast, but we did hit some fish. 8, 10, & 12 color cores and 200, 250 coppers all took bites. We didn’t really have a hot bait. Regular size Yeck Lighting on a 200 copper took a couple and a SS Magic Man on an 8 color took two Steelhead. No rigger bites on the morning trip. We started our afternoon trip in 300 FOW in the 02’s and trolled north. 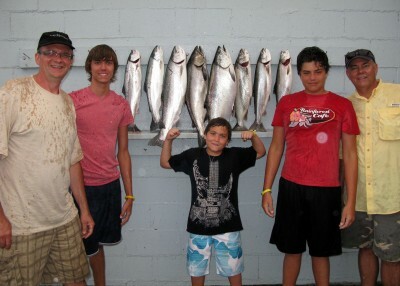 We hit a good fish right away on our high wire with Mountain Dew/Cold Steel rig but it got away. Our other high wire out 170’ with a White Slick Light Green Tape/Green Death Big Water Rig was the hot diver on the p.m. trip. It took 3 of our Kings. When we hit the 03’s we put it on a in troll. We had decent action. Our chute rigger down 65 with a pair of regular size Fuzzy Bear Yellowtails went 3 times. The Yeck Lighting took a couple more and a Copperhead on a 10 color core went twice. It’s hard to find the time to get this report out when we are running doubles so the reports might not be real timely when we do run them.